Catalogue of the coins of the Kingdom of Italy, the colonies, the Republic, and the euro. 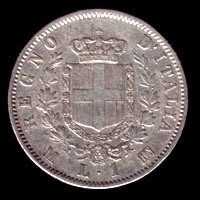 The coinage in use in the Kingdom of Italy was strictly related to the French decimal one introduced by Napoleon on 1803. 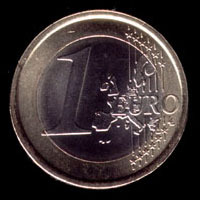 The currency adopted was the Italian Lira with a value corresponding to the value of 4,5 g of silver or 0,29 g of gold. The Lira was part of the Latin Monetary Union among France, Italy, Belgium, Switzerland, and Greece, an organization founded on 1865 to defend the value of the various currencies of the five countries and to simplify the international exchanges; the Latin Monetary Union was ended on 1926. According to the Italy-San Marino convention, the coins of the San Marino Republic are minted in Rome since 22 March 1862. 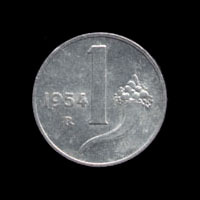 The minting was suspended from 1939 to 1972. According to the Lateran Treaty (11 February 1929), in Rome are minted also the coins of the Vatican City.